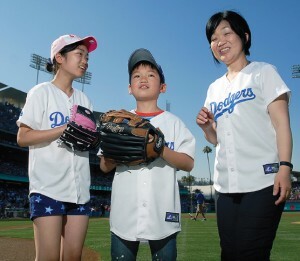 The Los Angeles Dodgers will host their annual salute to families of Japanese heritage on Friday, July 12, and this year, a coalition of Japanese American partner organizations are joining forces, with the goal of making this year the biggest Japanese Community Night ever. The festivities are scheduled for 7:10 p.m., prior to the game at Dodger Stadium against the Colorado Rockies. A pregame ceremony featuring the Nisei Week Court along with Nisei World War II veterans will be followed by Friday Night Fireworks. More guests and events will be added in the weeks to come. Past ceremonies have included taiko and dance performances, dignitaries from Japan, singers, and introductions of community leaders. This year, the Go For Broke National Education Center has teamed up with the Japanese Cultural and Community Center, Japanese American National Museum, Little Tokyo Service Center, Japanese Citizens League-Pacific Southwest District, and Japanese American Optimist Club in a community-wide fundraising effort. Over the years, the Dodgers have featured several players with a Japanese family lineage, including Hideo Nomo, Kazuhisa Ishii, Dave Roberts, Hiroki Kuroda, Takashi Saito, and current relief pitcher Brandon League. A portion of the each ticket sale goes to the Japanese American organization of your choice (which must be designated at the time of your online purchase). Tickets are available in the Loge Box MVP section for $55 (retail $65) or Reserve MVP for $25 (retail $28). Tickets are sold on a first-come first-served basis, with limited quantities available. Additional tickets or special requests cannot be guaranteed once all quantities are sold. Early purchase is recommended if you are ordering multiple tickets and wish to keep your seat locations together. Order tickets by Monday, June 24, to allow for timely delivery of tickets. To purchase tickets or for more information, visit http://www.goforbroke.org/dodgers.asp.